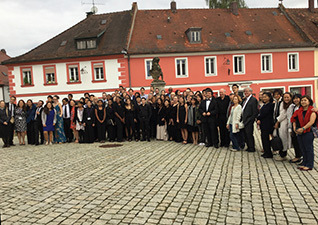 InterHarmony International Music Festival, from July 2 – August 11, 2019, invites you to study with its internationally renowned faculty of soloists and chamber musicians for up to six weeks of string, piano, woodwind, brass, percussion, or vocal instruction in one of its gorgeous European settings. IIMF’s piano and string professors bring together decades of pedagogical and performance experience, offering an international outlook with an edge honed in the famous Russian school. The woodwind, brass, and percussion tracks combine unique chamber music opportunities and starring orchestral roles, while the vocalists can specialize in either art song or opera. All students will enjoy a life-changing opportunity to develop their musical abilities, grow artistically, network with fellow musicians and perform in concert. Through our Outstanding Guest Artist Series, participants will be brought together with some of classical music’s brightest lights. Past guests include Vadim Repin, Nikolaj Znaider, and Alfred Brendel. This summer’s festivals will be held in Acqui Terme, Piedmont, Italy & Sulzbach-Rosenberg, Germany. Each session offers master classes on various instruments and numerous public concerts. Students will receive four one-hour private lessons, ample practice facilities, and the possibility to perform in orchestra and chamber ensembles following intensive coaching. Weekly excursions will take participants to a variety of stunning destinations in each locale.